Another new name to me and plenty of interest here. 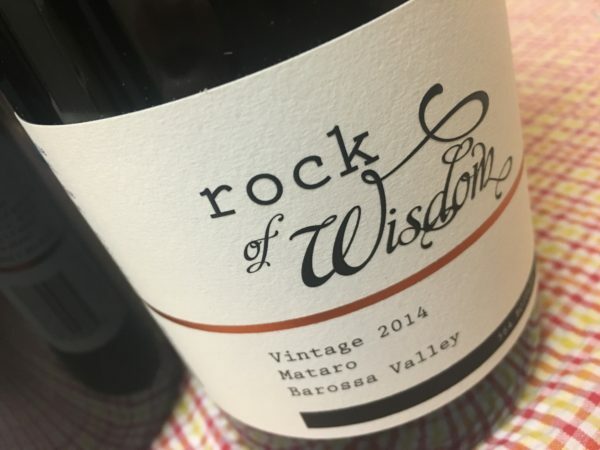 Rock of Wisdom is the label of Pete (‘Rock’) + Sofi (‘Wisdom’) Hiscock who are making small batch Barossa reds in a modern, hands-off style. This Mataro is sourced from a 17yo vineyard at Koonunga in the Barossa. Fruit is picked and cold soaked for a day, then wild fermented before 10 months maturation in oak. Bottled unfined and unfiltered with minimal sulphur. What I like here is the vitality. It smells surprisingly juicy (not always the case with notoriously reductive Mataro) yet still with a pink lamb meatiness (a little whole bunch action?) and a suggestion of vanilla oak. It tastes expansive, lively and ripe – but not heavy – with an unfettered exuberance that is so enjoyable. None of the dour Mataro about it. It’s not an ultra-long style, but you want to keep drinking it. Good stuff. Best drinking: 2017-2027. 17.7/20, 92/100. 14%, $28. Would I buy it? You know what, I would. I’d grab this off a list for sure.